This easy, healthy low carb Alfredo Sauce will be ready in less than 15 minutes with only six ingredients. This rich and creamy Alfredo Sauce with heavy cream is not only savory and delicious, but low carb and healthy as well. You’re going to love how simply and quickly it comes together! 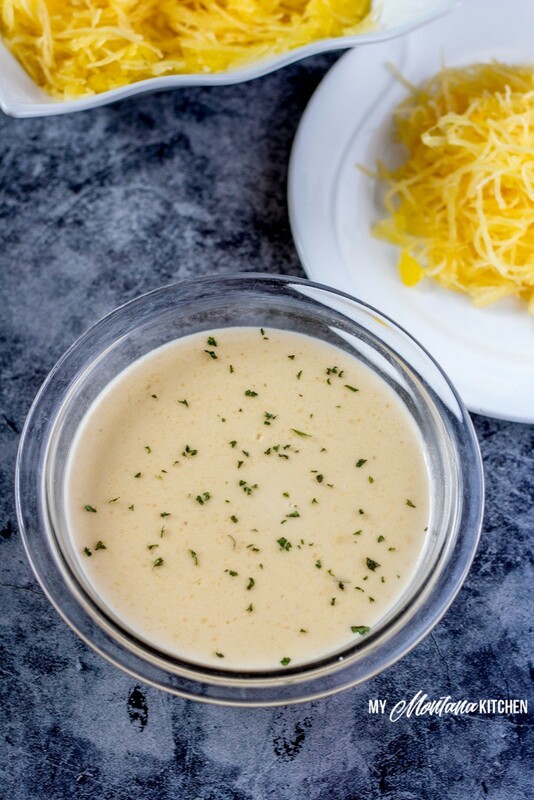 With a base of heavy cream and nourishing bone broth that is seasoned with freshly minced garlic, this easy low carb Alfredo Sauce recipe is going to become a family favorite. It’s the perfect topping for your favorite low carb pasta alternative, vegetables, or even low carb pizza! What Ingredients Are In Easy Low Carb Alfredo Sauce? 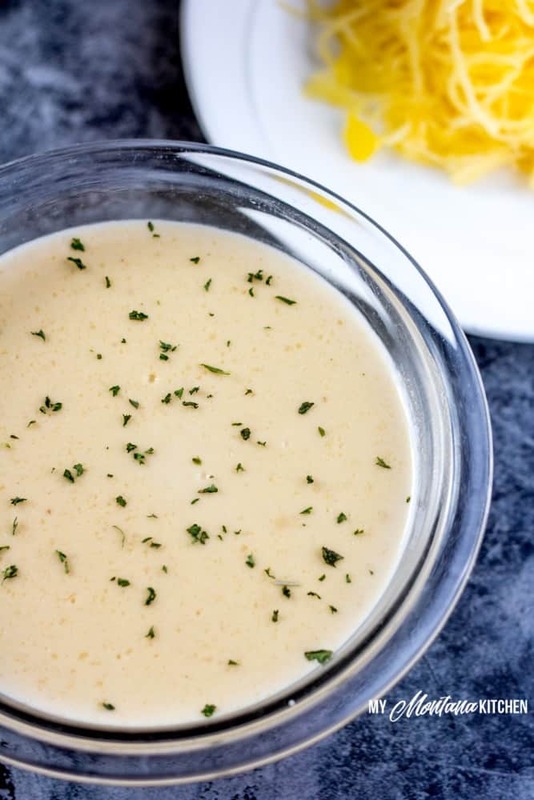 Most people think of Alfredo Sauce as decadent and a “treat”, but this recipe eliminates the flour and uses nourishing bone broth and immune boosting garlic. The bone broth in the base of this healthy Alfredo Sauce is so good for you. You can make it from scratch at home in your slow cooker or Instant Pot or you can buy all natural bone broth by the carton. Bone broth is nourishing for your gut, provided necessary nutrients for healthy joints, helps your skin and hair grow strong and healthy, boosts your immune system, and even gives your metabolism an extra push. It’s a fabulous ingredient to include in your cooking whenever possible for both its rich flavor and many health benefits. Garlic is a low calorie, high benefit food that has so many health benefits you could almost call it a medicine. Studies have shown daily garlic consumption to help protect against getting sick, to help lower cholesterol and blood pressure, and to improve your overall health. This recipe uses fresh garlic for the tantalizing flavor it adds to your healthy homemade Alfredo, but those health benefits sure are an awesome bonus, aren’t they? How Do You Make Healthy Low Carb Alfredo Sauce? Believe it or not, this easy Alfredo Sauce recipe only takes 15 minutes to make! You’ll make it on your stovetop in your favorite skillet or pot. The first step is to melt your butter and sauté freshly minced garlic cloves in it. This recipe uses five garlic cloves because, well, you can never have too much garlic! Once your garlic is fragrant, add in your heavy cream and bone broth. Stir this very well to fully blend the butter, garlic, heavy cream, and bone broth together. Once it’s all stirred together thoroughly, add in the parmesan. Then reduce your heat and simmer for 5-10 minutes. What do you use as a low carb Alfredo Sauce thickener? Traditional Alfredo sauce uses flour or some other thickening agent to get that thick and creamy consistency Alfredo is so well known for. However, this recipe allows the broth and cream to reduce in a gentle simmer and as that happens, the creamy garlic cheese sauce thickens naturally. That’s what allows this Alfredo Sauce to stay low carb. By using heavy cream that thickens as it reduces, you eliminate any starches that would be traditionally needed. Now that you’ve made your easy Alfredo Sauce what do you do with it? You could serve it with Dreamfield’s pasta or shirataki noodles for a more traditional Alfredo pasta dish. It’s also delicious on spaghetti squash noodles or zoodles (zucchini noodles made by using a spiralizer). Or you can drizzle it on a blackened chicken breast and sprinkle with some diced tomatoes. It’s also great on a low carb pizza crust or in a casserole. Toss some steamed vegetables in it for vegetables in garlic parmesan cream sauce on the side with your favorite meat. One great thing is how family-friendly this recipe is. My kids get super excited any time I tell them I’m making Alfredo Sauce! Our normal way is to toss in some steamed broccoli and cooked chicken, but we have several recipes we enjoy…and I think you’ll really like them, too. Once you know how to make up this simple homemade Alfredo Sauce recipe, you can make it up in batches and have it on hand to make these simple recipes even faster because you’ll be able to skip steps and just add your own low carb creamy garlic parmesan sauce to them. If you haven’t made this yet, you need to. Alfredo chicken casserole is an overwhelming reader favorite here at My Montana Kitchen. It easy, healthy, and mouthwateringly delicious. This pasta dish uses noodles for the pasta, healthy sausage, and is made in just one skillet. What’s not to love about it? If you’ve never had this sausage Alfredo recipe, you’ve been missing out. Succulent shrimp tossed with creamy garlic Alfredo atop your favorite pasta…sounds like the perfect date night dinner, doesn’t it? If you happen to have some leftovers or just prefer to cook in large batches when you make your low carb Alfredo Sauce, what is the best way to keep it tasting delicious? No worries, even that is easy! Simply let your sauce cool. Once it’s room temperature, pour the low carb Alfredo into an airtight container for keeping in the refrigerator. That’s it! Use it within several days so it doesn’t go bad. 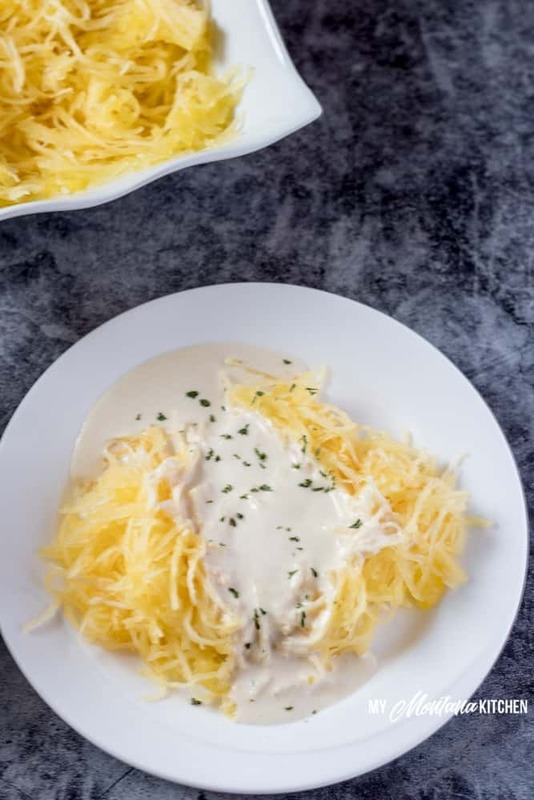 With so many amazing low carb Alfredo Recipes to choose from, that shouldn’t be too hard to do! Pull your low carb Alfredo Sauce out of the fridge and heat it in either the microwave or in a pan on the stove. However, the best result will be on the stovetop. When you reheat it, whisk it all together and cook it slowly over low heat. Turning the heat up too high can cause the sauce to scorch and also separate. So now the only thing you have to decide is which Alfredo Sauce meal you’re going to try first! In a medium skillet, melt butter and saute garlic for 1-2 minutes. Add heavy cream and bone broth, stirring well. Add Parmesan and stir again. Reduce heat and simmer for 5-10 minutes, or until sauce begins to thicken. Be sure to use the exclusive code "MYMONTANA" to get 15% off your order from Kettle and Fire when you order bone broth! Click here for Weekly Menu Plans & Shopping Lists! Yum! 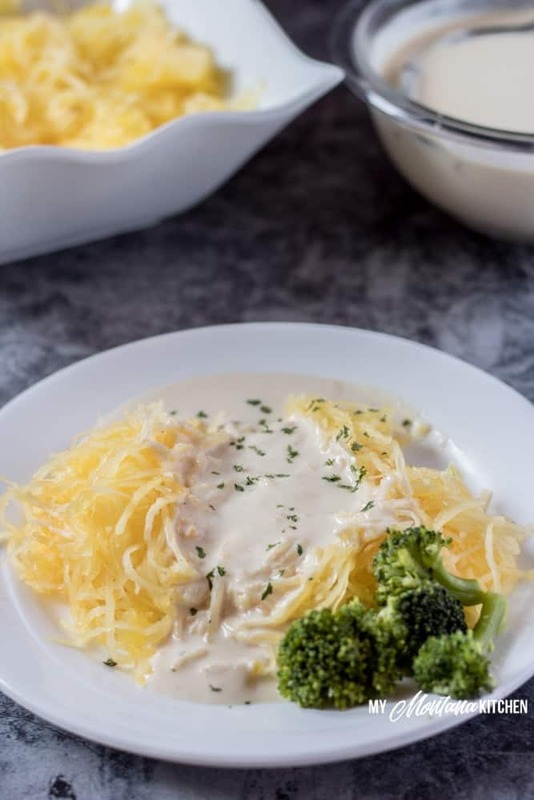 Alfredo sauce is SO delicious, and I love the idea of simply letting the broth and cream thicken a bit on its own rather than using flour- simple and low carb in one!